OK. You’ve cleared the dining room table and have ticked off “clean silverware” and “organize the kitchen” on your holiday prep checklist. Good on you for being prepared and all set to tackle the large gatherings and meals that take place during this festive, but busy, time of year. Ready for the next step? 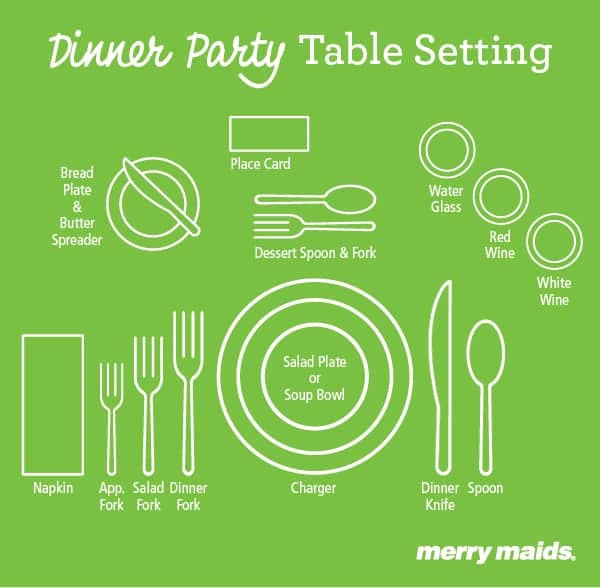 It’s time to learn to how to set your table for special occasions like holiday meals or dinner parties. 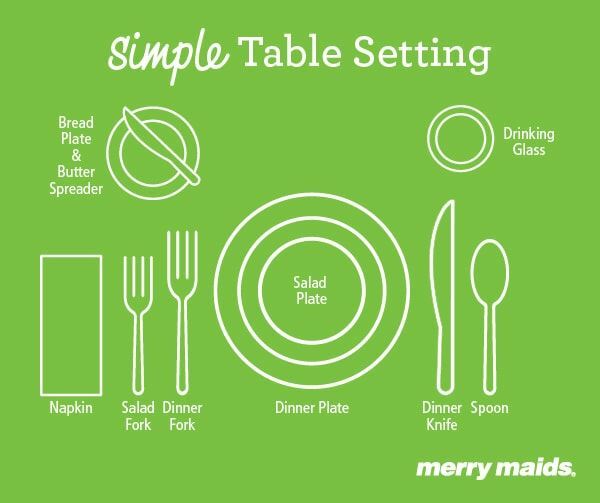 Even knowing how to set a simple table for your daily family dinner can add a special touch to mealtimes. The following instructions can teach you how to set a table for dinner. Before you learn how to set a dining room table for a dinner party or more formal occasion, it helps to start simple with the table-setting basics. Place a dinner plate down. If you’re starting with a salad, place the salad plate on top of your dinner plate. Arrange the silverware. Start with the dinner fork on the left of the plate and the salad fork to the left of the dinner fork. Not having salad for dinner? Skip that fork. Next, place the dinner knife to the immediate right of the plate with the blade facing inward, followed by the spoon. Tip: Here’s a handy trick for figuring out how to lay silverware out: Work in alphabetical order from left to right! Fork. Knife. Spoon. Set the drinking glass above the dinner knife, at about 1 o’clock. Place the bread plate above your fork at 11 o’clock. If you’d like, you can place a butter spreader on top of the bread plate, but this is optional. Arrange the spreader with the handle on the right and the blade facing down toward the plate, either horizontally or diagonally. Fold your napkin and place it to the left of the forks, under the forks or in the center of the plate itself. The more courses you have for a meal, the more dishes, glasses and utensils you’ll need to set out. Your actual setting will vary based on what foods you’re serving and how many courses your meal has, but here is a fundamental guide to setting a table for a dinner party. Dishes, glassware and silverware will all be arranged around the charger, a large decorative plate that serves as a placeholder until the main course is served. You can use a placemat instead of a charger. Forks always go to the left of the plate, while knives and spoons always stay on the right. When serving multiple courses, silverware is placed depending on what will be used first. For example, if your meal starts with an appetizer before moving to a salad and then an entrée, your forks will be arranged from left to right in the order they’ll be used: appetizer fork, salad fork and dinner fork. The exceptions to this rule for flatware are dessert spoons and forks. Those should be placed horizontally above the charger or placemat at 12 o’clock. Napkins should be placed in the center of the charger or to the left of the forks. Soup bowls and salad plates can be placed on top of the charger as these courses are being served. When the entrée arrives, the charger will be replaced by the dinner plate. Glasses and stemware will again be placed above knives and spoons. Your water glass or goblet should be over the point of the knife at 1 o’clock. From there, your stemware will be ordered from the outside in, as with flatware. For example, if you’re starting the meal with a champagne toast, then moving to chardonnay, pinot noir and port for dessert, your stemware will be ordered as follows, from right to left: champagne flute, white wine glass, red wine glass, port glass and water goblet. As with the simple dinner setting, the bread plate sits above the forks at 11 o’clock. An optional butter spreader can be placed on top of the bread plate. The spreader should be situated with the handle on the right and the blade facing down toward the plate, either horizontally or diagonally. Whether you’re having a holiday gathering or hosting a fun dinner party for friends, there are plenty of ways you can add a festive touch to the event. Naturally, for holiday meals you can use themed napkins, napkin rings and placemats. Additionally, never underestimate the wow factor of a well-executed seasonal centerpiece. For more formal dinner parties, consider spicing up your dishes — with patterns and color, not cayenne. Mix and match plates and bowls so that no two guests have the same set. Just make sure there’s a unifying color or theme running through each dish so that the dinner experience you provide is whimsical rather than disheveled. You can also set nameplates in front of your guests’ dessert silverware. Make this a little more fun by attaching the nameplates to a small gift or interesting trinket. Learning how to set a table for dinner may seem complicated. However, once you understand that a place setting is meant to be logical — rather than just pretty — and know how to set a simple table, you’ll find there’s nothing to it. And if you need a helping hand while preparing for holiday meals or dinner parties, don’t hesitate to contact your local Merry Maids for some cleaning backup. Our professional housekeepers can get your home tidied up and ready for guests so that you can put the finishing touches on your place settings.